Jupiter is named after the most important deity in the Roman pantheon; brother of Neptune, Pluto, and of his wife, Juno. Named after characters from the Jovian mythology. Flybys by Ulysses and Cassini-Huygens. Ulysses first flew by Jupiter in April 1998 and made use of Jupiter's gravitational pull to be put in an orbit with a high inclination to the ecliptic. The 6.2 year orbit makes it possible for Ulysses to study the Sun's polar regions. 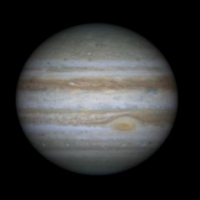 Cassini-Huygens passed by Jupiter in December 2000 at a distance of 137 Jupiter radii. The energy that Cassini gained from this gravity assist was used to reach Saturn in July 2004. The time taken by the planet to complete exactly one orbit around the Sun with respect to the celestial sphere. The time in which the planet rotates around its axis exactly 360° with respect to the celestial sphere. Defined as the time between two successive sunrises over the meridian. Calculated as the ratio of the magnetic field strength at the equator divided by the cube of the equatorial radius.